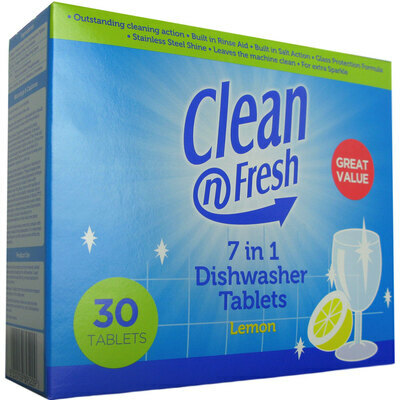 Suitable for use in busy work environments, our 7 in 1 Dishwasher Tablets have been designed to produce exceptional results with every use. Formulated to offer high levels of cleaning with an active stain remover which cuts through greasy residue, each of these individual tables also boasts rinse air for a brilliant shine. Sale action cuts through tougher foods while the glass protection agent reduces the risk of corrosion while keeping stainless steel with its original shine. The quality of your dishwasher is also a priority with each tablet removing dirt from your actual machine and leaving it clean and sparkling. For all your cleaning needs, Gompels also stock Dishwasher Salts and Rinse Aid to keep your glasses and dishes looking like new.